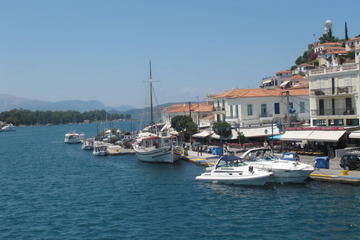 The port of the island of Aegina. From 1827 until 1829 Aegina served as the temporary capital of the newly founded Greek state. It was during that period when Governor Ioannis Kapodistrias had impressive neoclassical mansions built to house his headquarters and core government buildings that today are important tourist attractions. Horse-drawn carriages, a nice way to visit the town. Sites worth seeing include the main church close to the port, the small church at the entrance of the port, the Tower of Markelos and the Old Prisons that used to be the First Orphanage School of modern Greece. One can see many nice cottages all around the island, with stone walls beautifully adorned by nice flowers, especially bougainvilleas. ​If you want to go around the island you should better rent a car or a motorcycle. Bus service is a reliable option. 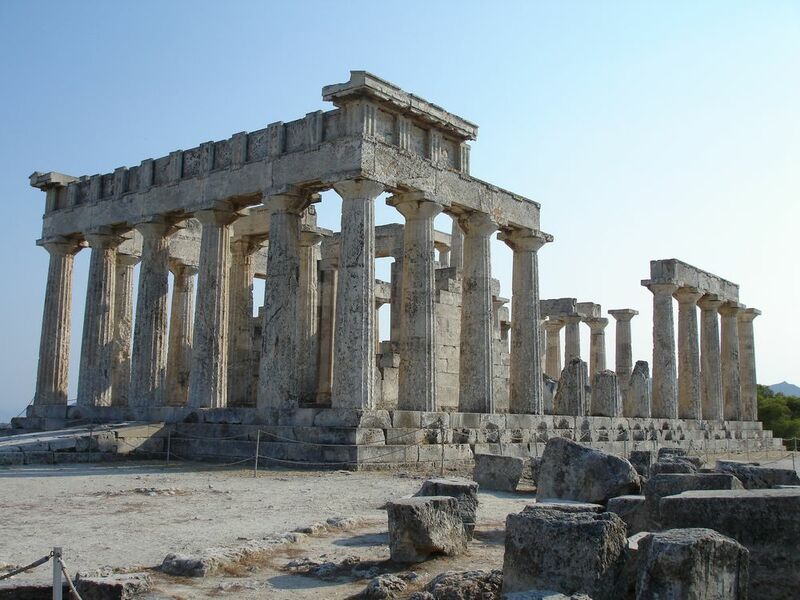 Though the island is small, it boasts a great number of sights and natural beauties, highlight of which is The Aphaia Temple, a monument of great archaeological interest located about 20' from the city, and a stunning example of ancient Greek architecture, set in a pine-tree forest, offering extensive views across the island. It forms in fact an equilateral triangle with the Parthenon and the Temple of Poseidon at Sounion, the so-called “sacred triangle” of the antiquity. You may also want to visit the hill of Kolona, close to the port of Aegina, an area inhabited from the prehistoric times through the classical period. Extensive walls and foundations have been discovered and excavations are ongoing. Agios Nektarios Church and Monastery, Aegina. 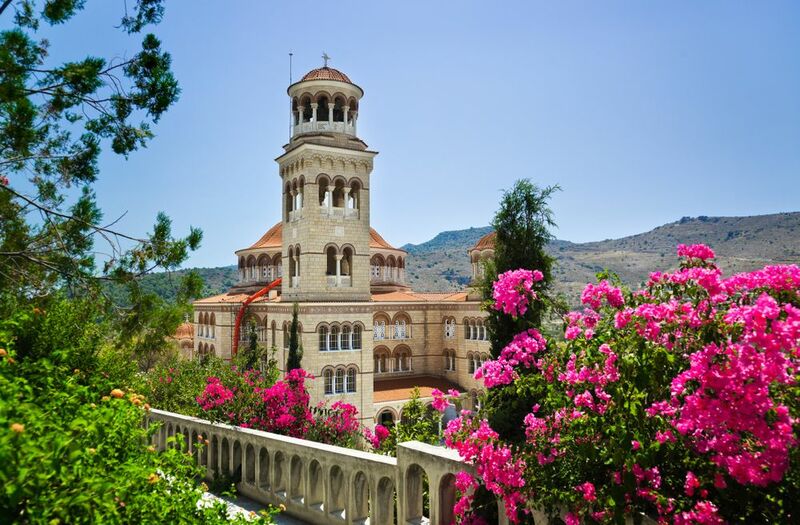 Agios Nektarios Church and Monastery, built for the most recent Greek Orthodox saint, is visited by large numbers of people, many of them seeking help from this miracle-working saint, who died in 1920. Another interesting site of religious significance is the monastery of Panagia Chryssoleontissa (Holy Mary of the Golden Lion) for women. There are some nice beaches within walking distance from the town of Aegina, but still you may need to explore the rest of the island. Famous beaches on Aegina are Aeginitissa (very organised, with beach bars), Marathonas, Perdika, Kamares, Souvala, Vagia and Agia Marina. If you like hiking, you can climb up the Mt. Ellanion. There you can find an archaic altar devoted to Ellanios Zeus (“Zeus of all Greece”). Aegina is the island of the pistachio nuts, called “Fistikia”, in Greek. Try them dried or roasted, salted or not. Their harvest is celebrated every year with “The Aegina Fistiki Festival”, taking place September 15-18) with lots of food, music, dance, theater & art. ​The weather in Aegina is a bit dry and warm, still a lot better than Athens. From Aegina you can also travel to Agkistri, Methana and Poros. During summer, there are also boat trips to the ancient theater of Epidavros. There are plenty of hotels and rooms to let all around the island. Prices for accommodation, food and drinks are much better than Athens or the Cyclades. For hotel accommodation in Aegina click here at Booking.com. Swimming at the island of Angistri. ​Only 19 nautical miles away from Piraeus, and visible from nearby Aegina, Agkistri is an easily accessible paradise. Azure waters, pine trees and lush vegetation (where many bird species find refuge) are the main characteristics of this tiny, charming island, of less than 1,000 inhabitants! There are three large settlements on the island: Megalohóri (or Mýlos), Skála and Limenária. For a hotel at Angistri click here at Booking.com.